CHICAGO (AP) — With an embarrassing predicament in sight, Knicks coach David Fizdale implored his team to treat the end of another lost season like a playoff series. 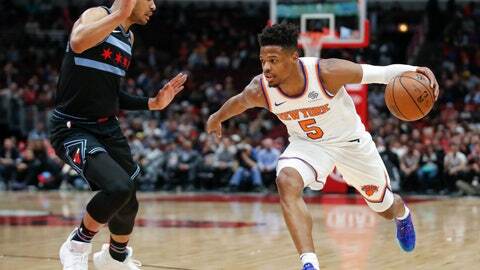 The Knicks responded, escaping the possibility off finishing with their worst-ever record by beating the Chicago Bulls 96-86 on Tuesday night. Dennis Smith Jr. scored 25 points and Mitchell Robinson added eight points and 17 rebounds for New York. With one game remaining, the Knicks (17-64) can only tie for the worst season in franchise history. A loss to the Detroit Pistons, who are seeking to lock up a playoff spot, would give New York a record matching only its ugly 2014-15 campaign. New York, which had already secured the NBA’s worst record and a draft position no worse than fifth, won back-to-back games for the first time since late February. The Knicks will face a plenty motivated Pistons team on Wednesday. The Bulls, meanwhile, lost for the 32nd time at United Center this season, a franchise record. Chicago’s previous worst home season was in 2000-01. The Knicks, who led by as many as 20 against a depleted Bulls lineup, needed a late 5-0 run to pull away. Smith hit a pair of free throws and Damyean Dotson made a 3 to put the Knicks up 89-79 with 2:42 left. Kevin Knox added 17 points and 10 rebounds and Dotson finished with 12. Ryan Arcidiacono led the Bulls (22-59) with 14 points and Shaquille Harrison added 13. Smith scored 19 points in the first half and Knox added 11 as the Knicks led by as many as 20 in the first quarter. The Bulls cut into the lead late in the second quarter. They trailed 57-50 at halftime. For the second straight game, Smith played with a sore lower back. He was originally slated to come off the bench, but that changed when guard Mario Hezonja came down with an illness and was a late scratch. Smith showed no sign of pain. “That’s the thing, it’s just the only way that I know. I just go hard, that’s all I know,” Smith said. Knicks: Fizdale wasn’t sure if G Kadeem Allen, who is out with a concussion, will be available for the finale. … G Allonzo Trier missed the game with a strained left calf. … G Emmanuel Mudiay was ruled out for the final two games because of a sore left shoulder. Bulls: Zach LaVine (bruised right thigh, right knee tendinitis), Kris Dunn (strained back), and Otto Porter Jr. (right rotator cuff), didn’t suit. … Before the game, Dunn admitted he struggled to find his role with the Bulls this season. “I guess you can say that. Earlier in the season I was being aggressive. I kind of defer away from Lauri (Markkanen) a little bit, kind of sacrifice my role to see how it went. … It allowed me to figure out who I was as a player. That’s to be aggressive,” Dunn said. Boylen took over for Fred Hoiberg, who was fired in December. He said he came to understand the stress of being an NBA coach. “I learned that when you become the head coach, you don’t sleep as well. I learned that when you become the head coach it’s your responsibility to coach every guy regardless of his past, or his salary or whatever as hard as you can. And that’s what I’m trying to do,” Boylen said. Knicks: Finish the season Wednesday night by hosting a Pistons team that’s trying to hold off Charlotte for the final Eastern Conference playoff spot. Bulls: At Philadelphia on Wednesday night to conclude their season. The 76ers are locked into the No. 3 spot in the East playoff bracket.